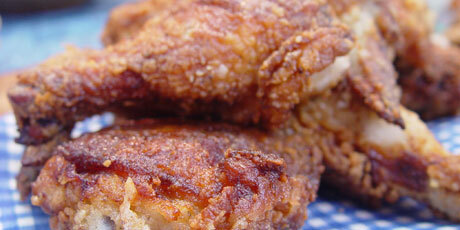 Crispy on the outside and moist and juicy on the inside. 1. Pre- heat oven to 350ºF. 2. Put chicken pieces into a large bowl or a zipper plastic bag and pour in buttermilk, salt and pepper. Massage milk into the chicken pieces and place in the refrigerator to marinate for several hours or, ideally, overnight. 3. Fit a paper lunch bag into a second bag, so that there is a double layer of paper. Add flour, salt and pepper. Drain chicken pieces well and add 2 at a time to the bag of flour. Shake well and rest on a rack until all the chicken pieces are well coated with flour. 4. Melt shortening in a large, straight-sided skillet and heat to 360ºF. Add the chicken pieces and fry them on one side until golden and crispy. If you have a lid for the pan, use it while the first side cooks but remove it once you flip the pieces or they will get soggy. Using tongs, turn the chicken and cook on the other side until golden and cooked through, approximately 20 minutes in total. Drain well on paper towels.